My friend Helene and I decided we had to throw a surprise baby shower for our friend Angela who is expecting her first baby in March. Helene is from Sweden so all of this is a new experience. It’s been so fun planning this and getting things ready. We consulted some baby shower planning books and were aghast at the amount of planning that apparently goes into these things. Committee"? Eight weeks of preparation? Helene and I joked about putting together a pert chart with dependencies, budget, resources, etc. Really? We did most of our “planning” in about 10 minutes then hit the party store! Why get bogged down in details and logistics when there are cute napkins and banners to be bought? We decided to play two games. One is just having each guest write their best piece of advice and giving it to Angela. We bought the little cards for this at the party store and I think it’s a great idea. The other game is “multi-tasking mom”. Each person gets thirty seconds to hang clothes on a clothes line while holding a baby and talking on a cell phone. (Please note, we won’t be using a real baby.) The person who hangs the most clothes gets a prize and of course points are deducted for dropping the baby or the phone. Angela will be able to take home a laundry basket full of little clothes! 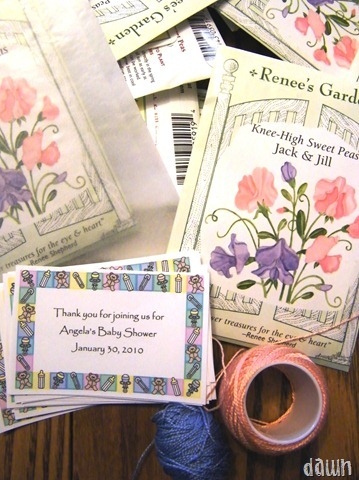 The party favors are these sweet pea seeds from Renee’s Garden. I chose them because Angela doesn’t know yet if she is having a boy or a girl so I thought the pink and blue colors were appropriate. I wrapped each packet in a glassine envelope with a custom made sticker and embroidery cotton to tie it up like a little parcel. Helene chose a tea party menu of small sandwiches, cakes, tea and coffee. 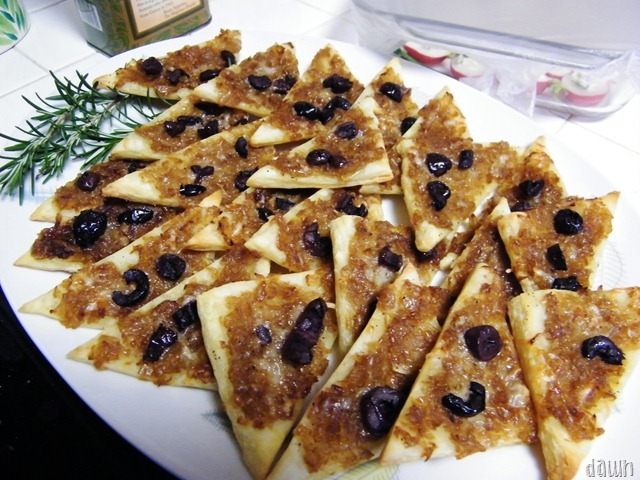 I contributed two dishes, both from Martha, radishes with chive butter and a simplified version of pissaladiere – caramelized onions with gruyere and olives on puff pastry. Oh, and some of my Christmas fruitcake which is tasting better all the time. I bought a vintage plant holder on ebay to use as a centerpiece. Miss R did the flower arrangement and I think it turned out beautifully. 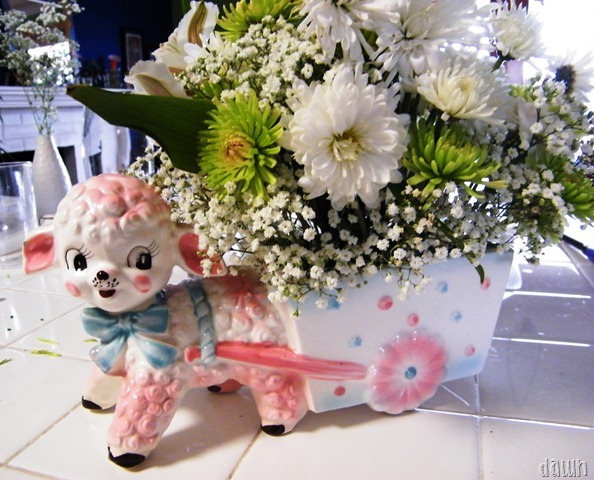 She enjoyed doing it so much we have decided to try to do arrangements for our table now and then. Today was the big day and the whole shower went off without a hitch. Angela was completely surprised and thrilled. Her mom is visiting from Texas which made everything all the more special for everyone. Angela loved the flower arrangement and was so happy to be able to take it home. Thank you to everyone who kept it a secret and made it so much fun! Very sweet! Sounds like it was both fun and practical!